– Darkwing Duck and co. are, of course, her enemies, per default. – Dr. Reggie Bushroot is responsible for her mutation and ended up in the role of Plant-Duck Mentor (she’s currently a live-in student) – she’s also harboring a secret crush on him, but has no intentions of ever telling him. – The Liquidator is the only other member of the F5 she actually likes. – QuackerJack is the source of much aggravation… they tend to squabble like siblings (because he gets a huge kick out of picking on her). Fies absolutely loathes him. – Megavolt is… well, they don’t interact much (neither really bothers much with the other, except that Megsy was the only one to question her presence during Fearsome Plots – and is the first to call her ‘Fizz’ and it kinda stuck – I think QJ was the first to specifically call her Fizzy). Other than that, she finds him, and his light bulb-obsession, rather confusing/disturbing. 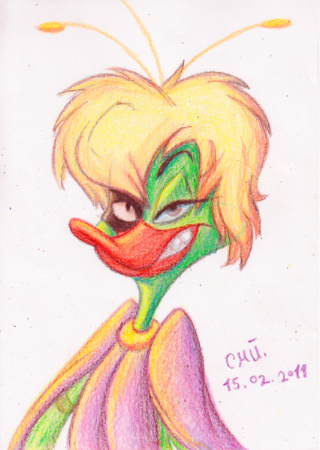 – Negaduck is, to her, merely the tyrannical leader of the Fearsome Five (she only respects that his plans, if successful, do have very nice pay-offs). He, himself, doesn’t really give a crap about her. Super powers: Plant-Duck abilities (gets nourishment through sunlight and water; telepathic link to plants; excellent swimmer; can do the same stuff with her mutated body that Bushroot can with his). Weaknesses: Plants don’t really listen to her; not a genius like Bushroot; needs more water than Bushroot (being based off a water-plant). Personality: Unstable (bi-polar tendencies); emotional; unhinged; irritable. Quirks: Hates being hugged; she’s also a grouchy zombie in the morning. As she is bilingual, she occasionally uses German exclamations. She was born in Germany (German father, St. Canardian mother – both mallards), but made regular visits to the States and her mother’s birth-city; studied music in Germany, though didn’t graduate, and tried to make her career anyway. However, not really having healthy moral standards to begin with, she couldn’t quite pull that off (mostly due to antisocial attitudes towards her managers and the few fans she’d accumulated). She produced one mostly-unsuccessful studio album in Germany, then moved to the States and was working on her second album when a trip with her family resulted in a terrible accident with a semi transporting dangerous chemicals. The wreck itself didn’t hurt her family, but the chemicals from the truck did, for as they were walking to see if the driver needed help, a bolt on the tank burst under pressure hitting her mother in the head and instantly killing her, whilst her father was drenched with the acid-like chemical as it spurted out, dying painfully. Miss Schnabel, being a little farther behind, only got splashed on the side of the head, resulting in the permanent disfiguration of the right side of her face (she dawned the mask after that). She dropped her singing career altogether and, eventually, moved to a city near St. Canard, where she took up odd jobs (like working in a gas-station) to pay for her crummy apartment before she fell fully into her antisocial tendencies and found she could no longer handle working or even shopping. She started racking up a police record of small-time theft, which lead to her losing her job and apartment. She fled to the mountains and took up residence in a cabin and, later, a cave. She continued her criminal activities to survive. Ironically, before her mutation, she hated sunlight and mostly came out at night, particularly after her accident. Eventually (and, of course! ), she learned about St. Canard’s resident mad-scientist-turned-mutant (along with many of the other criminals) and became fascinated, actually obsessed, with him and his work. She decided she wanted super-powers too (as that would make her life a little more manageable, or so she thought), and began studying up on him, reading everything she could find (his written articles, his criminal activities, etc..), particularly relating to the experiment which resulted in his own mutation. Originally, she had thought she might just ASK him to help her out (it was obvious she could not recreate his machine without him), but quickly discarded that stupid thought and plotted to capture him and then hope she could somehow convince him. Last note: In regards to her relationship to the Fearsome group as a whole, she is not a member. 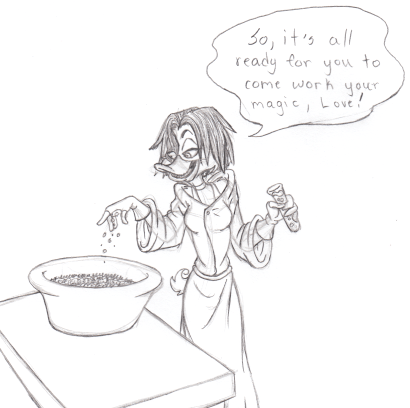 She is considered by the others to pretty much be on the same level as any of Bushroot’s plant minions, but with the benefit of being another mutant plant-duck instead of ‘just a plant’.